The National Guild of Piano Teachers auditions were held at River Hills Community church in Lake Wylie, SC, on Friday, April 23rd, 2010. Students received Local, District, State, & National honors, and have become members of the National Fraternity of Student Musicians. Students memorized and performed from 2- 10 memorized pieces each. Students participating included: Mirie Ahn, Dae Bigach, Caroline Chiaroni, Nicholas Harris, Aaron Klazinga, Abigail Klazinga, Joanna Klazinga, Justin Klazinga, Grace Mooney, Mary Katherine Mooney, Blake Turner, Brice Turner, Raeann Thomas, Lauren Williams, Morgan Kuchenbrod, Alex Wilson, Hannah Bonney, Harry Snow, Christos Karamitros, and Gabe White. Adjudicator for the event was Mrs Kimberly Graham, Greer, South Carolina. 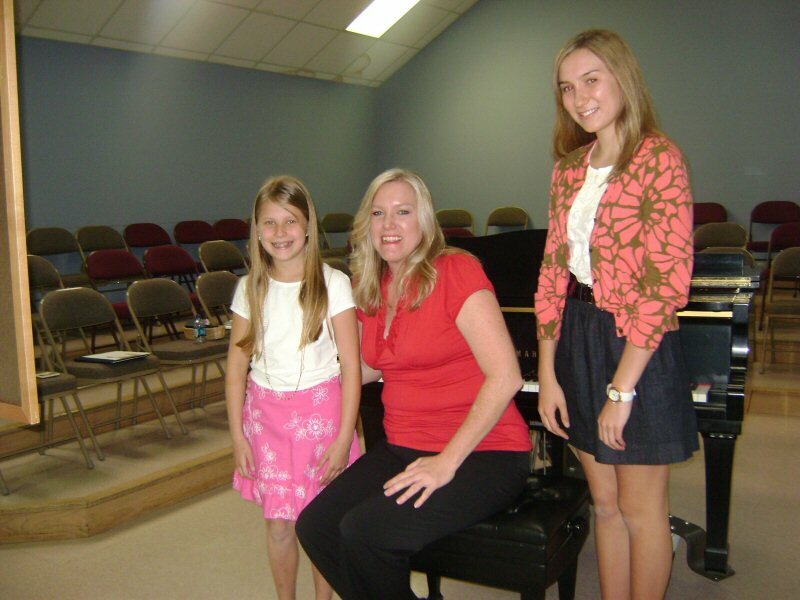 In Picture: Kimberly Graham (adjudicator), and student on left Lauren Williams, and on right, Caroline Chiaroni.